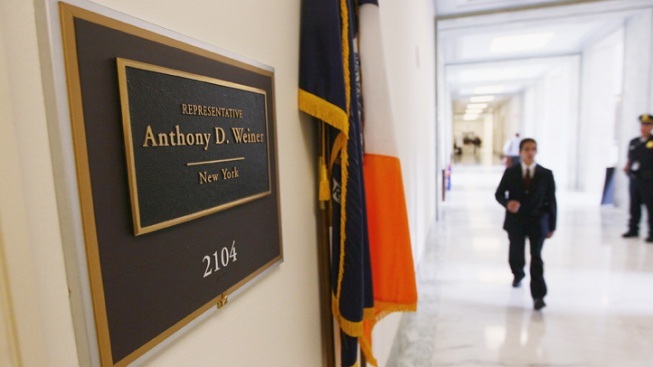 A plaque outside the office of Rep. Anthony Weiner in Washington, the day he resigned. Gov. Andrew Cuomo has the power to call a special election to fill the U.S. congressional seat vacated by embattled Rep. Anthony Weiner, who announced his resignation Thursday after a cyber scandal. Individuals who want to run for the seat would have to turn to their county committee parties to get on the ballot, according to Board of Elections spokesperson John Conklin. Once Cuomo declares a special election for the seat, he has a minimum of 70 days and a maximum of 80 days to set the date, according to Conklin. It’s not clear whether Cuomo is inclined to call a special election for the seat before November, given the extra costs and resources. “If the governor thought there was some urgency that the seat needed to be filled immediately,” he might call one, said Conklin. If Cuomo called a special election today, the earliest it could happen would be the third week in August. Alternatively, Cuomo could call for a special election to coincide on Election Day. Some names that have been floated include: Democratic state Assemblyman Rory Lancman, Republican City Councilman Eric Ulrich, Democratic Councilman Mark Weprin, former Democratic Councilman Eric Gioia, former Democratic Councilwoman Melinda Katz and Democratic Assemblyman David Weprin. The person elected to the seat would only be there to serve out the remainder of Weiner’s term, which expires in 2012. In the meantime, the 9th congressional district will go unrepresented -- but constituents have other representatives to turn to, including Sens. Charles Schumer and Kirsten Gillibrand. All this could be for nothing if the seat is eliminated in the redistricting process next year; two congressional seats are set to be cut as a result of New York’s declining share of the national population, and one of those seats was expected to cost a New York City Democrat a job. No state legislator has gone on record to confirm the 9th congressional seat would be eliminated, but if it is cut, the person who wins this special election would be out of a job just months after being elected.